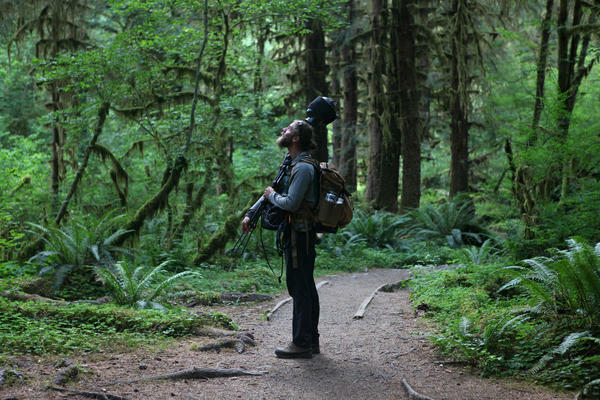 Matt Mikkelsen carries "Fritz," his microphone system, to the path in the Hoh Rain Forest that leads to One Square Inch of Silence in Washington's Olympic National Park. Fritz, the microphone system used by Mikkelsen and his mentor, audio ecologist Gordon Hempton, stands on a tripod. They use their recordings to promote the idea that natural sounds are complex, diverse and important. Near Hoh River Trail in Washington state's Olympic National Park. It's a little before 5:00 on a summer morning, and Matt Mikkelsen stands not so far down a trail in the Hoh Rain Forest in Washington's Olympic National Park. 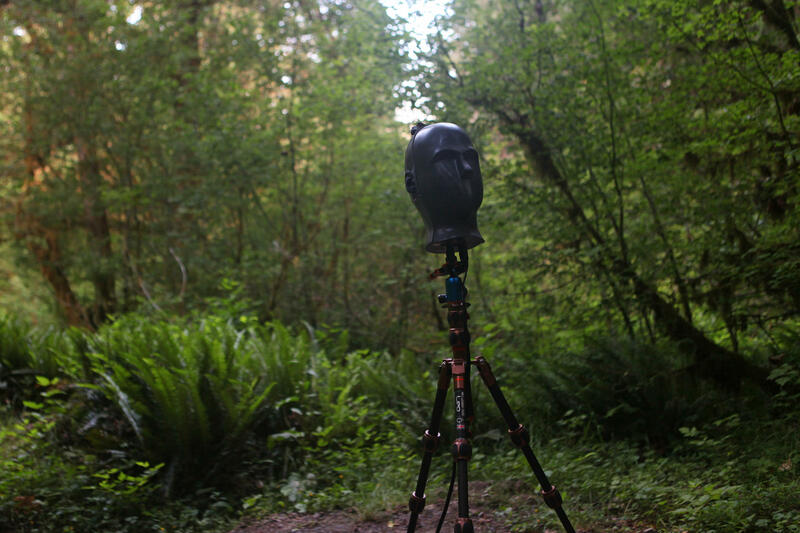 In the dense forest, dominated by massive Sitka spruce trees dripping with tangles of moss, Mikkelsen has just set up a tripod, topped not with a camera but with a disembodied black foam head. Mikkelsen, an audio technician and recording specialist, works with a nonprofit called One Square Inch of Silence, founded by his mentor, audio ecologist Gordon Hempton. Its purpose is to promote the preservation of quiet places — that is, places without human-made sounds. Protecting wilderness, they argue, means more than guarding against development and industry, but also keeping spaces free of noise pollution — including the sound of aircraft far overhead — that can affect the people who visit these places and the wildlife that calls them home. In 2005, when Hempton founded One Square Inch of Silence, he designated a spot, a few miles up the Hoh River Trail into the rain forest, the quietest place in the U.S. and marked it with a small, red stone. Mikkelsen, 24, is tall and slim, with a long auburn beard. His friends call him "Sasquatch," but that doesn't seem to suit his gentle, quiet demeanor. "Even though protecting 1 square inch seems like a very small, insignificant amount of space," he explains, "due to the nature of sound and silence, it's preserving this whole ecosystem." If that inch stays quiet, that means that the entire valley, and miles around it, will be similarly intact and free of intrusive noise. Hempton defines a naturally quiet place as one where there are 15 minutes of non-human-made sound. He estimates that there are fewer than 10 such places in the U.S.
As Mikkelsen adjusts the sensitivity of his recording, the dawn chorus seems to explode around the valley. "In a forest like this, it's so dense, I can only see maybe 50 yards in one direction, if you're lucky," he says. "But I can hear for miles." That sense, of how far you can hear, is known as your auditory horizon, and much of the time — indoors or in a city, for example — it doesn't extend very far. But in the forest, with eyes closed and a little focus, it sprawls. "In a place like this your auditory horizon isn't just 1 or 2 miles," he says. "You can hear everything that's happening in this valley. ... It's like we're listening to 5 miles or 10 miles around us right now. It's crazy." Mikkelsen then offers headphones connected to Fritz, so visitors can hear what Fritz's hypersensitive ears are picking up. The sensation is more than mere amplification, because you can still perceive the direction and distance of each twitter and rustle, thanks to Fritz's ears. "When you listen to it through a microphone system like this," he says, "you all of a sudden realize that you're listening to hundreds, if not thousands, of birds." It's like your own hearing, enhanced to an impossibly intimate level. But since One Square Inch of Silence was established, the Hoh Rain Forest has gotten louder, through increased air traffic and the testing of loud Navy jets nearby. Now, Hempton and Mikkelsen are planning to make One Square Inch part of a larger effort to identify, designate and protect quiet places like it around the world. "Just the fact that this place exists is enough to give me hope for the world," Mikkelsen says, softly. "And I think that's the reason why we conserve wilderness in the first place." We're going to do something unusual for a moment. We're going to stop talking. And in those few seconds, I want you to focus on what you hear around you starting now. Maybe you heard the hum of an air conditioner or cars, probably some kind of human-made sound. Humans have altered the environment in profound ways. And one way that's easy to overlook is what we've done to our sound environment. All this week we've been on a road trip, our summer collaboration with the website tracking hidden wonders, Atlas Obscura. Today in our final installment, the site's co-founder Dylan Thuras brings us his search for silence. DYLAN THURAS, BYLINE: We've traveled an incredible, exhausting, noisy 2,200 miles up the west coast in search of hidden wonders. Today I'm leaving the highway behind and heading into the Hoh Rain Forest in northern Washington, looking for something increasingly rare. My guide is Matt Mikkelsen, but his friends call him Sasquatch. MATT MIKKELSEN: Everyone, control your breathing if possible. THURAS: That's Matt. Matt's 24 years old. He's tall, slender with a big bushy beard. It's 4:30 in the morning. We're standing just outside of the Hoh Rain Forest listening to the birds. MIKKELSEN: When we talk about silence, really we're just talking about the lack of human-created noise. I've been to many naturally silent places that are incredibly loud. THURAS: Matt's part of an organization called the One Square Inch of Silence. 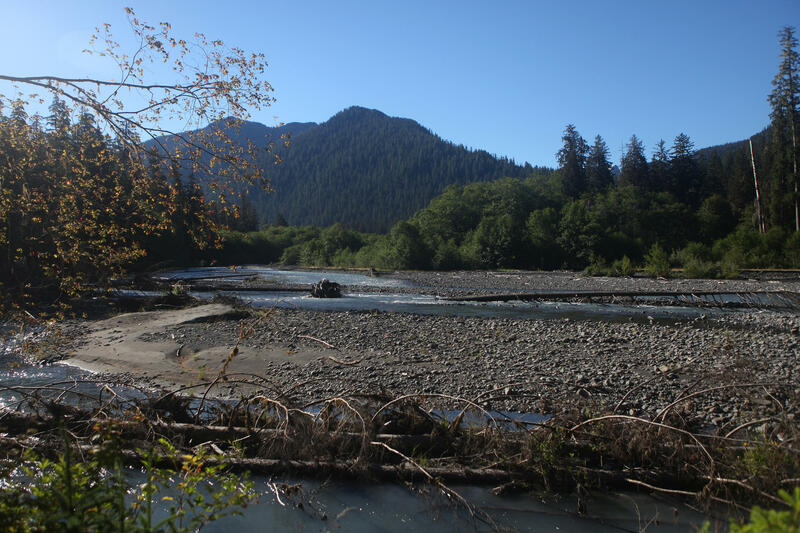 It's dedicated to preserving the natural sounds of the Hoh River valley. MIKKELSEN: It truly is one of the last great quiet places that we have not only in the United States but on the planet. THURAS: The project started by trying to protect a single square inch of the park from human-made noise. That's what Matt is trying to protect, just 1 square inch of silence. It's not just an idea. It's an actual place about a 3 1/2-mile hike into the rainforest. It's not affiliated with the national park. There's no signage pointing it out. But today Matt's guiding us there. As we hike into the rain forest, we're immediately enveloped by this fairytale environment. We're standing before this gigantic tree that is just overflowing with moss. MIKKELSEN: I mean, they call a bigleaf maple because the size - it's like a dinner-plate-sized leaf. It's like you could almost curl up on one and take a nap. THURAS: But not long after we start our hike, we hear our first combustion engine. MIKKELSEN: So the first time we've been out here all day that a plane has passed over. It's a single engine, like a - you know, just a little prop plane, someone probably sightseeing, which is fine. THURAS: It's a small reminder that naturally quiet spaces are rapidly disappearing. MIKKELSEN: Looking at the continental U.S., I'd say we have under 10 places left that would be considered, you know, really, truly quiet places with a noise-free interval of more than 15 minutes. And 10 is probably an overestimation. THURAS: That's what counts as a silent place - 15 minutes where you can listen and hear only the sounds of nature. But even the One Square Inch of Silence, chosen for its remoteness from flight paths and roads, is under threat. Navy Growler jets, among the loudest jets in the world, are flying over the park with increasing regularity. There's currently a court case attempting to stop the flights. MIKKELSEN: Because of the way that sound travels, if we can get jets to avoid flying over Olympic National Park, it's preserving this whole ecosystem by doing that. THURAS: Matt records the sounds of nature for a living. In fact, he recorded many of the natural sounds in this piece. To get the best sounds, he uses specialized audio gear. Today he's got this foam head-shaped microphone with him. MIKKELSEN: So this is Fritz. And Fritz is the main microphone that I do most of my recording with and listening with. THURAS: Fritz is meant to record sound the same way a human being hears it. That means replicating the way sound reflects off of a human head. Fritz has a nose, a mouth, eye sockets, and on the sides of the head are molded skin-density ears, each with a sensitive microphone inside of it. MIKKELSEN: My dream is to one day get molds of my ears put onto Fritz so that way Fritz has my ears for the rest of his life. I think that'd be a weird cool thing. THURAS: As we continue hiking, we round a curve, and suddenly the soundscape completely changes. We're looking out over the Hoh River at the Olympic Mountains. They're huge and snowcapped. Matt explains that the glacier is slowly, pebble by pebble, washing the mountains out to sea. MIKKELSEN: And when you listen underwater to this river, you can hear the stones moving downstream. It's very musical. THURAS: The act of listening goes far beyond just Matt's professional calling. It's his philosophy, one with obvious parallels to meditation and Buddhism. At the core of that philosophy is helping people listen to hear what they may not even realize they're losing - a landscape devoid of human noise. MIKKELSEN: And only another about quarter mile or so to go until we're at One Square Inch of Silence. THURAS: The entrance to the One Square Inch of Silence is marked by a kind of doorway formed by the arched roots of an enormous tree. MIKKELSEN: Once we pass through this kind of opening in the roots of this Sitka spruce tree, we're going to not speak to each other. We're going to as quietly as we can walk to the designated spot of One Square Inch. Don't expect anything necessarily. You know, you just kind of got to be there and see what happens. THURAS: And so we go in. I walk the small, winding paths over the fallen trees and across the little streams. I find the small red pebble that marks the One Square Inch of Silence and sit. After a while, Matt leaves me on my own, and I listen. THURAS: After nearly an hour, I walk back out. MIKKELSEN: His eyes are so wide. I didn't know if you were ever going to come out. THURAS: I could have stayed in there for a really long time. I could have stayed in there for a long time. It was really amazing. It was actually very moving for me. I was surprised by my reaction. I'd recently lost a loved one, and I hadn't had much time to contemplate it. But alone in nature, with the only goal to listen, I was overcome. It's actually so - it's unbelievably refreshing to just listen, to force yourself to listen and to listen to such a beautiful landscape and a beautiful place. It's like a real gift. MIKKELSEN: You're definitely not the first person who I've brought out here who comes out in tears, myself included. It often ends that way, and not in a bad way. THURAS: It's an incredible space. MIKKELSEN: Give me a hug, bud. In a lot of ways, the One Square Inch of Silence is arbitrary. You can move it somewhere else in the park or maybe even somewhere else in the world if you could actually find a square inch of silence. But it's the idea of saving spaces of natural sound that matters, places where people can seek silence and truly listen. CHANG: That was Dylan Thuras, co-founder of Atlas Obscura. ALL THINGS CONSIDERED teamed up with him for a road trip up the west coast of the U.S. For more about the places we went this week, visit npr.org. (SOUNDBITE OF BIRDS CHIRPING) Transcript provided by NPR, Copyright NPR.